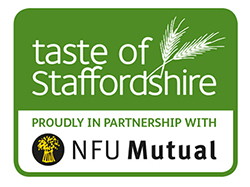 Joining forces with NFU Mutual’s Stone Agency, Destination Staffordshire have re-launched their Taste of Staffordshire Quality Marque, an accreditation designed to highlight and promote those businesses providing top quality food and service in the area. Forty-five businesses across Stafford and Stone currently display the award, which is open to any-and-all food and drink businesses which currently hold a five-star food hygiene rating, so as to ensure that lesser establishments don’t waste inspectors’ time. Upon application, the premises will be visited by a qualified inspector under the guise of a mystery diner. This inspector will assess the eligibility of the business and ultimately decide whether or not to award the accreditation. Senior Partner at NFU Mutual’s Stone Agency, Luke Withers, said of the partnership, “NFU Mutual is one of the largest insurers in the food and drink sector, with more than 900,000 customers nationwide, and 100 years of working with food and drink producers. “We have a reputation for quality in customer service and we are proud to partner with Destination Staffordshire and help celebrate food & drink businesses with the same commitment to providing an excellent experience for customers. Destination Staffordshire’s visitor economy manager, Graeme Whitehead, also commented, “The food and drink sector has a significant role to play in Staffordshire tourism, contributing £612m to the local economy in 2015. The brand’s official re-launch took place today (24 March) at the National Brewery Centre in Burton. Those who wish to apply for accreditation under the scheme are advised to contact Destination Staffordshire via email (taste@staffordshire.gov.uk) or phone (01785 277397).